I’ve been following Andrew on Twitter for a while and have enjoyed his posts. So when I heard that the author of the term “Enterprise 2.0” had written a book on the topic, I was initially skeptical of the value to me. How much new stuff would there be in the book for someone who, while not an expert, was very familiar with the topic? After hearing about some of the hype, I decided to give the book a try. Aside from having a handy book that I can hand people to learn about Enterprise 2.0, the book helped me crystallize my understanding of Enterprise 2.0 and helped me think of better ways to explain it to people. So money well spent, but what did I learn? This definition has been criticized for being too technical and not focusing enough the people or processes. There are two basic defenses to the definition against that criticism. We are talking about the pursuit of the organization’s goals. The technology is clearly listed as a tool that helps to achieve those goals. It doesn’t say that Enterprise 2.0 is the deployment of the tools. It is the USE of those tools to accomplish the goals that are the purpose of being an organization. This is defining the WHAT of Enterprise 2.0, not the HOW. The how, which is addressed in more detail in Section 2 of his book, is almost all about the people. My only issue with the definition is the term “social”. This is an accurate term, but full of negative connotations in the business world. As I read the book, I realized that “collaboration” was a better term, not in definition, but in the business context. This may warrant a post unto itself as it isn’t central to how good the book is, but it is an important part of the ongoing evolution of Enterprise 2.0. Throughout the section, there is a talk about the ties between people and how Enterprise 2.0 tools can connect people with different degrees of ties. Andrew illustrates each level with a different case study to show how the tools work to allow people to work together better. 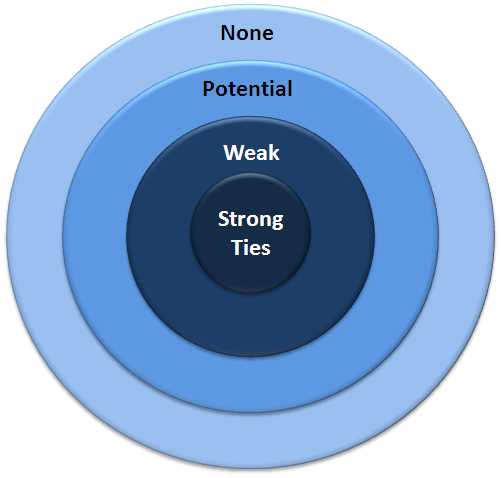 Strong Ties: These are people you interact with regularly now. His case study talks about the implementation of a wiki to allow people a new way to capture items and collaborate. I would put many of the existing, Enterprise 1.0, collaboration tools here as well. eRoom and SharePoint are two such products. Weak Ties: These are people that you know of and may have met, but don’t really now. Andrew talks about using Facebook here to connect a dispersed work force and to build a better sense of community within the company. The goal is to get to know people and make weak ties into strong ones. Potential Ties: Here we are talking about people that you don’t know and are unlikely to run into during the normal course of business. Here Andrew talks about a blend of software, including wikis and blogs. People discover each other be discovering content. The information isn’t organized in the traditional manner, but is tagged, allowing structure to emerge. By finding information, and learning about the contributors, connections can be made. None: No ties and there may not be a reason to form them. Tools like prediction markets can allow them to work together to create intelligence from the masses. It is important to note that any tool in an outer ring of Andrew’s “bull’s-eye” can be used in an inner ring to strengthen and maintain those ties. The second section was a little disappointing. It wasn’t that I thought that it was wrong or incorrect, but I was just hoping for more. In this section, Andrew talks about the challenges. He addresses many misconceptions and how to work to dispel them. He addresses the ROI issue and the fact that adoption is more than implementing tools, but getting people to use the tools. Andrew makes lots of great points, but I just wish there was more detail. Then again, the purpose of the book isn’t to tell you how to make it work. Every organization is different and brings different baggage to the table. This means that there is no correct way or correct platform that will work everywhere. This is a bitter truth, but an important one to understand. Andrew does offer good tips and tells you that it will not be an overnight success. It will take time to succeed, but the benefits are tangible. The strength of this section is that it lets you know that Enterprise 2.0 is not a silver bullet. The section makes you think about your organization and helps you start to formulate, in your mind, how you might begin to make it work. Section two makes you think, and that is a good thing. I have now butchered Andrew’s thoughts. Go read the book. It will all make sense then. I received nothing, not even a copy of the book, for writing this review. All that ever happened was that Andrew asked me to write an Amazon review, which I did using excerpts from this full review. If my word isn’t enough to help you decide that you need to read this book, check out these reviews. I didn’t read them until after I wrote mine, but I think they add to the overall picture of the book well. Thomas Otter of Gartner shared his thoughts. I’d have to agree with most of his points, especially regarding the addition of a reading list at the end of the book. Gil Yehuda wrote a review as well. While the first part of the review sounds like someone who drank too much Kool-Aid, the latter part raises quite a good point that Thomas Otter had hinted at in his review, Chapter 8 could be a book unto itself. Be prepared to read that chapter a few times and to research some of the underlying concepts if you aren’t in management. As I said above, would love more details. Jon Ingham wrote a review which is a little more critical. John thinks that Andrew focuses on the technology too much, but as I said in my review, that is a discussion for another day. Jon has the HR perspective and I think it is an important one in the broader discussion. I am confused as to whether or not he recommended the book. I am debating jumping into the technology/people debate. Maybe when I have a little more time. One thing I am not debating is this: If you have any interest in Enterprise 2.0, read the book. Aaaargh – you pipped me to the post and stole my next blog post – I just finished the book yesterday ! Its a great primer to the technology, for non-techies. Is it a good book? I think so, but I guess I did not get a huge amount from it, as I too have followed the Professors blog and tweets for a a couple of years. However your right in that its a great book to hand to people as an introduction to the topic.